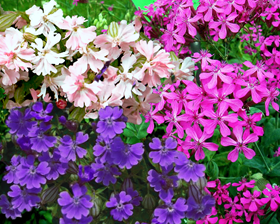 A charming, but exquisite stunner for the spring or summer garden. Its habit is branching so it reaches only 20-25cm in height yet cascades or spreads for 25cm. Descriptively it's one mass of 1cm blooms. Uniquely the blooms have no consistent colour. The buds are deep pink opening to salmon and maturing to white, purple and red conveying this majestic blossom effect. 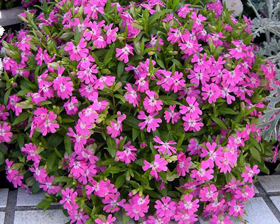 Ideal for hanging baskets, containers and direct sown, or planted out, is a striking carpeting plant of better character and form than alyssum. Sow in spring outdoors where they are to flower. Prepare the ground well and rake to a fine tilth before sowing. Sow 3mm deep in rows 30cm apart. Germination usually takes approximately 21 days. Seed can also be sown outdoors in early autumn for over wintering and earlier flowering, or alternatively can be sown indoors in early spring 1.5mm deep in seed compost. Germination takes 7-14 days at 15-18C. Transplant the seedlings when large enough to handle, gradually acclimatise to outdoor conditions and plant out when all risk of frost has gone. When large enough to handle thin out to 20cm apart. They prefer a sunny, open site and well drained soil.